Genes encoding proteins in a common pathway are often found near each other along bacterial chromosomes. Several explanations have been proposed to account for the evolution of these structures. 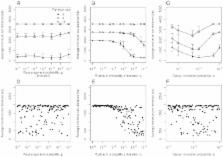 For instance, natural selection may directly favour gene clusters through a variety of mechanisms, such as increased efficiency of coregulation. An alternative and controversial hypothesis is the selfish operon model, which asserts that clustered arrangements of genes are more easily transferred to other species, thus improving the prospects for survival of the cluster. According to another hypothesis (the persistence model), genes that are in close proximity are less likely to be disrupted by deletions. Here we develop computational models to study the conditions under which gene clusters can evolve and persist. First, we examine the selfish operon model by re-implementing the simulation and running it under a wide range of conditions. Second, we introduce and study a Moran process in which there is natural selection for gene clustering and rearrangement occurs by genome inversion events. Finally, we develop and study a model that includes selection and inversion, which tracks the occurrence and fixation of rearrangements. Surprisingly, gene clusters fail to evolve under a wide range of conditions. Factors that promote the evolution of gene clusters include a low number of genes in the pathway, a high population size, and in the case of the selfish operon model, a high horizontal transfer rate. The computational analysis here has shown that the evolution of gene clusters can occur under both direct and indirect selection as long as certain conditions hold. Under these conditions the selfish operon model is still viable as an explanation for the evolution of gene clusters. Genes involved in a common pathway or function are frequently found near each other on bacterial chromosomes. A number of hypotheses have been previously presented to explain this observation. A particularly influential theory is the selfish operon model, which posits that horizontal transfer could promote gene clustering by favouring transfer of arrangements of genes that are close together. Subsequent theoretical development and analysis of genomic data have contributed to the debate about the plausibility of this model. Here, by re-examining the evolutionary dynamics of gene clusters, we provide and discuss conditions under which gene clusters can evolve. We find that first, some form of bias for clustering is required for clusters to evolve. This bias can be in the form of bias in horizontal transfer towards genes that are close together, or direct natural selection for gene proximity. Our computational work does not present a theoretical obstacle to the selfish operon model as a possible explanation for the evolution of gene clusters. A systematic comparison of nine bacterial and archaeal genomes reveals a low level of gene-order (and operon architecture) conservation. Nevertheless, a number of gene pairs are conserved. The proteins encoded by conserved gene pairs appear to interact physically. This observation can therefore be used to predict functions of, and interactions between, prokaryotic gene products. Comparative genomics: the bacterial pan-genome. Bacterial genome sequencing has become so easy and accessible that the genomes of multiple strains of more and more individual species have been and will be generated. These data sets provide for in depth analysis of intra-species diversity from various aspects. The pan-genome analysis, whereby the size of the gene repertoire accessible to any given species is characterized together with an estimate of the number of whole genome sequences required for proper analysis, is being increasingly applied. Different models exist for the analysis and their accuracy and applicability depend on the case at hand. Here we discuss current models and suggest a new model of broad applicability, including examples of its implementation. Comparative genomic structure of prokaryotes. Recent advances in DNA-sequencing technologies have made available an enormous resource of data for the study of bacterial genomes. The broad sample of complete genomes currently available allows us to look at variation in the gross features and characteristics of genomes while the detail of the sequences reveal some of the mechanisms by which these genomes evolve. This review aims to describe bacterial genome structures according to current knowledge and proposed hypotheses. We also describe examples where mechanisms of genome evolution have acted in the adaptation of bacterial species to particular niches. Conceived and designed the experiments: ARF RL MMT. Performed the experiments: SB MMT. Analyzed the data: SB MMT. Contributed reagents/materials/analysis tools: SB MMT. Wrote the paper: SB ARF RL MMT. Copyright statement: Ballouz et al. This is an open-access article distributed under the terms of the Creative Commons Attribution License, which permits unrestricted use, distribution, and reproduction in any medium, provided the original author and source are credited. Complete mitochondrial genome of the Japanese snapping shrimp Alpheus japonicus (Crustacea: Decapoda: Caridea): gene rearrangement and phylogeny within Caridea. Identification of functional lox sites in the plastid genome.